This past Friday (Sept. 7th) marked the one year anniversary of the Equifax (EFX) data breach announcement. The breach, which exposed 143 million Americans’ personal information, sent EFX plummeting 37.23% from $142.72 to a low of $89.59 one week later. As you can see from the chart below, EFX has been steadily recovering since the lows made in the immediate aftermath of the breach announcement. 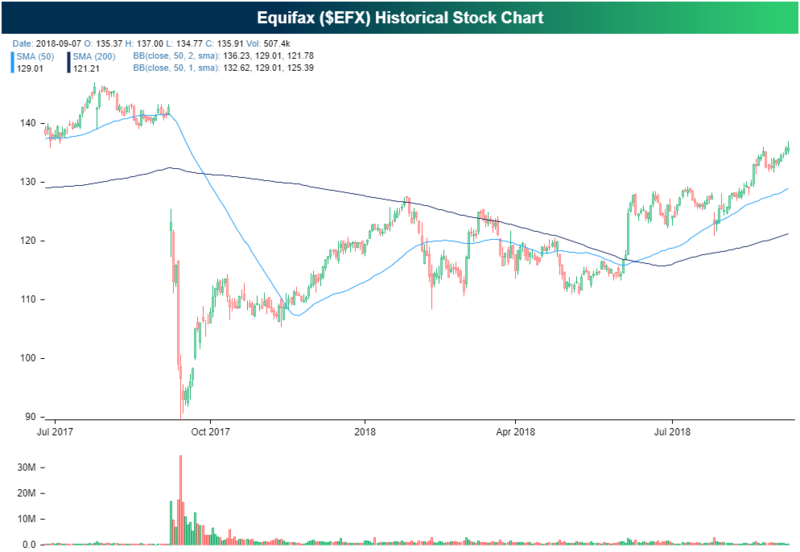 At the close on Friday, EFX was sitting at a 52-week high of $135.91, only 5.13% from its level before the data breach was announced and 7.55% from its all time high. After the breach was announced, many wondered how EFX could ever recover, but at this point just one year later, it’s been all but forgotten by investors.